The Pugh Manufacturing Co. Ltd., known latterly as the Pugh Specialty Co. Ltd., was a Toronto-based manufacturer of novelties that was a major player in the postcard industry in early twentieth century Canada. While Pugh postcards may be found less frequently today than those of the largest Canadian publishers, the number of different views and patriotic cards published by the company seems to have been very substantial and perhaps comparable to the output of those rival companies. Indeed, in a 1907 advertisement in Canadian Druggist, the company claimed to be able to show 7,000,000 cards to customers who cared to visit its booth at the Canadian National Exhibition. 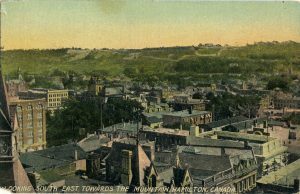 Its advertisements often boasted that the company was Canada’s largest supplier of postcards, although puffery of this sort was common at the time. In a 1979 presentation to the Toronto Postcard Club, John C. (“Jack”) Schaffter, the grandson of the company’s founder and an employee in the 1920s, recalled that the company had postcard salesmen working all over the country. Pugh Manufacturing Co. advertisement in the Canadian Druggist, 1907. The manager of Pugh Manufacturing Co. was Thomas James Pugh (1871-1958), a native of Kidderminster, Worcestershire, England. He was the son of Charles Pugh, manager of the canal wharf in Kidderminster, and his wife Sarah Bull. The family lived in the Old Wharf House, which was likely located in the part of Kidderminster depicted in this 1932 image. The family emigrated to Canada shortly after Charles Pugh’s death in early 1890 and was living at 15 Nassau Street in Toronto by the time of the 1891 census. In 1896, Thomas was proprietor of the Art Embroidery Co., 56 Bay Street, and by the turn of the century he was manager of the Cloak Manufacturing Co. at 18 Front Street East. Just a few years later, he was able to strike out on his own under the Pugh name (as recounted below). He was married on June 20, 1908 to Alice Maud Collier (1878-1955), a native of Wellington County, Ontario. The 1921 Census records the Pughs as childless and residing at 87 Erskine Avenue, Toronto. Thomas and Maud (as Mrs. Pugh appears to have been called) were buried separately, in their respective family plots in Toronto and Wellington County. Thomas’ sister, Alice Mary Pugh (1868-1954), is worthy of mention in her own right. In 1900, she was listed in the city directory as proprietor (“proprietress”, actually) of the Art Embroidery Co. at 67 Yonge Street — the company that Thomas had previously been running — and a few years later was working at the Pugh Manufacturing Co., as she appears to have continued to do until her marriage to Charles Schaffter in 1909. The couple lived in Winnipeg, where Schaffter was the superintendent of Bradstreet Ltd.’s western Canadian operations. For the first few years of the century, the Pughs (including younger brothers George and Frederick) lived with their mother, who died in 1905, at 497 Euclid Avenue. 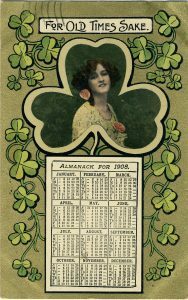 1908 calendar postcard manufactured in Great Britain, almost certainly by Millar & Lang of Glasgow. Posted on August 1, 1908, it suggests that Pugh may have been in the postcard business as early as 1907, when such a postcard would most likely have been ordered. This card is not numbered. History of the Pugh Manufacturing Co.
Beginning in 1903, the Pugh Manufacturing Co. was listed in the Toronto city directory as a “specialty manufacturing” or “specialty clothing” business with offices at 33 1/2 Church Street in Toronto. Thomas Pugh served as manager while his sister Alice was the saleslady. In 1904, Thomas was also stated to be manager, at the same address, of the Art Embroidery Co. — the business of which Alice had previously been proprietor, as noted above. The Pugh Manufacturing Co. may have expanded around 1909, for in that year a larger number of employees are listed in the Toronto city directory than had been named in earlier editions. The first Pugh postcards may have appeared in 1907, although that is far from certain. 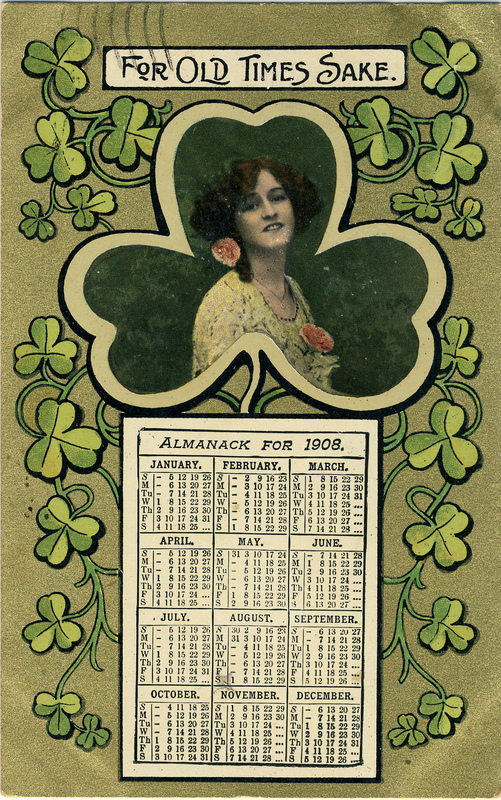 As with many “Golden Age” postcard publishers, Pugh’s production had largely ceased by around 1912. In that year’s city directory, it appears as the “Pugh Specialty Co.”, the name under which it continued to operate for at least another decade (and which appears on a minority of Pugh postcards). In the 1918 and 1922 city directories, the company was located at 38-42 Clifford Street, a street that ran between Niagara Street and Strachan Avenue and which is now a section of Richmond Street West. 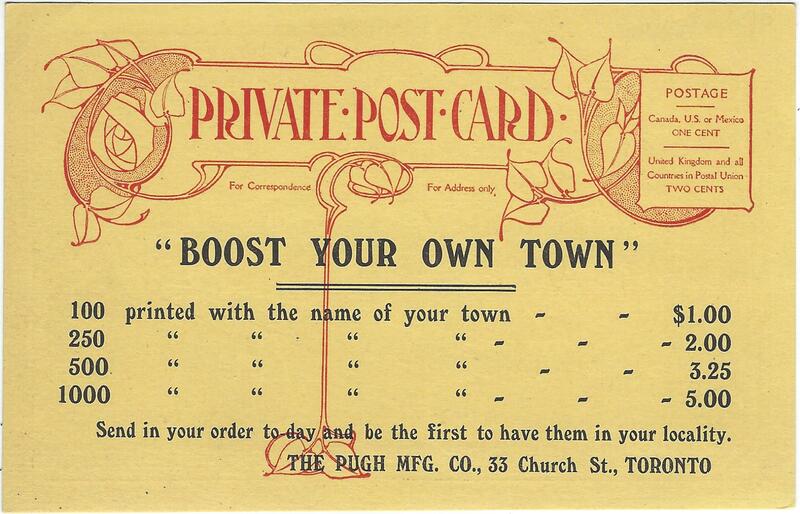 Thomas Pugh continued to be described as a “manufacturer of novelties” in the 1921 census and 1922 city directory, but there is no evidence that postcards were a part of his business by that time (any such evidence — e.g. in the form of examples of postcards in the style of the 1920s or bearing cancellations from the 1920s or later — would be gratefully received should it be discovered). Jack Schaffter recollected that the postcard business had waned by the early 1920s. By 1929, the firm was in receivership and none of its inventory or records were preserved. The Only Town on the Map — Toronto. Pugh’s “The Only Town on the Map” price list. Looking South East Towards the Mountain – Hamilton, Canada. Pugh Manufacturing Co. no. 487-38. Let it first be noted that it is unlikely that Pugh Manufacturing Co. or Pugh Specialty Co. actually manufactured any postcards. Like most other Canadian postcard “publishers” of the time, Pugh was a wholesaler, marketer and distributor of postcards – soliciting orders from local sellers, which, when received, were jobbed out to German and British printers. It is possible that some printing was done in Canada as well (the gold “frame view” cards may have been locally produced, for example), but there is no evidence that Pugh owned a printing press or designed or printed anything on its own. Jack Schaffter recalled that some of the black-and-white cards were produced in Canada while all of the colour cards were produced in England or Germany. He recollected that the colour cards required very large minimum orders, as high as 10,000 copies. A distinctive feature of most Pugh cards is the numbering. While some are unnumbered, many bear a numeric designation in the form ###-##, with a 3-digit number followed by a hyphen (or slash) and then a two-digit number. The 3-digit number (which is 2 or 4 digits in a few cases) represents a series (typically centred around a particular town), while the two digit number is the place of the card within that series. This numerical designation is sometimes preceded by the letters “To.” or “T.O.”, the significance of which is not known. This pattern of numbering appears on postcards printed both in Germany and in Great Britain, suggesting that the numerical designation was Pugh’s and not a printer’s reference. Pugh cards come in many designs and may have been sourced from a number of printers. A number of patriotic cards and similar fancy designs appear to have been produced by Millar & Lang of Glasgow (according to Mike Smith in The Canadian Patriotic & Heraldic Postcard Handbook, 1897-1945). The company also published its own “frame view” series (with gold frames), that would have been produced from photos sent to it for that purpose by druggists and general store owners across the country in need of a supply of inexpensive local postcards. Pugh also published a significant number of “bookmark” postcards (a name that refers to their shape). The bookmark cards are now quite scarce, either because fewer were printed or because they were less likely than full-size postcards to have been preserved in albums (or more likely both). The company also marketed series such as “The Only Town on the Map”, similar versions of which existed in the U.S. market. 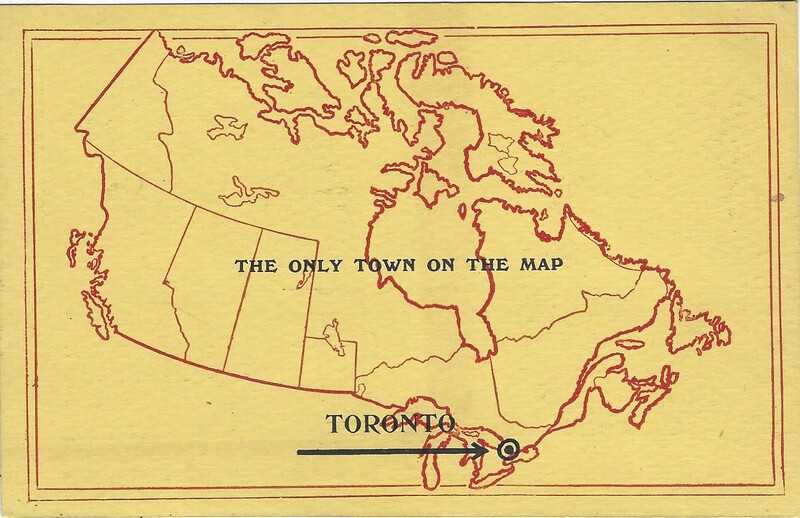 In the example shown above, Toronto is the town in question — more characteristically, the “only town” was a small village or crossroads hamlet that was too small to have many printed postcards of its own (with the “only town on the map” designation having an aspect of irony as a consequence). Main Street, Hartney, Looking West. Pugh Manufacturing Co., Toronto, no. 691/2, posted April 1910 from Hartney, Manitoba to Minot, North Dakota. Somewhat oddly, despite being smaller than regulation postcards, these bookmark cards could not be posted at the one-penny postcard rate if they had any kind of message, even though no such restriction applied to full-size postcards. Presumably the bookmark cards did not fall within the legal definition of “postcard” and, for that reason alone, did not enjoy the special rate. Error: Error validating access token: Session has expired on Friday, 12-Apr-19 20:21:58 PDT. The current time is Friday, 19-Apr-19 21:34:05 PDT.